Among the most heartwarming parables in the gospels is that of the Good Samaritan. We know the story of the man who is robbed, beaten, and left for dead. The priest and the Levite see him, but pass by. Then, a Samaritan comes upon the scene and rushes to help the man. He places him on his donkey, brings him to an inn, and instructs the inn keeper to take care of him and the Samaritan provides the inn keeper with some money and promises to return to settle any other expenses incurred. Numerous questions arise from this story: Why did the holy men ignore the man's plight? 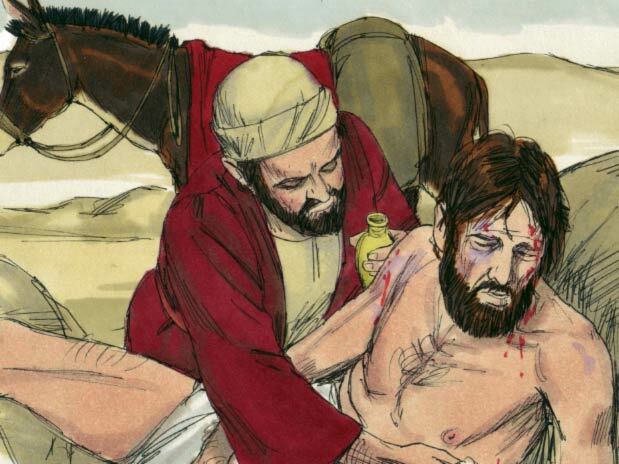 Why did Jesus' use of the figure of a Samaritan have such poignancy? What basic question did the parable address? What lesson should we take from the parable? The answers invite the listener to spend time in deep reflection and to formulate an effective response. First, the priest and the Levite, representing the priestly class of the tribes of Israel, see the man in the ditch. The victim of the robbers is unconscious and bloody. The priest and the Levite, perhaps, thought the man to be dead. According to the Law, coming into contact with a dead body would make them ritually unclean – not a good thing for leaders of Israel's liturgical rituals. The arrival of the Samaritan, a hated group among the Israelites, and his generosity and humanity toward the wounded stranger must not have sat well among Jesus' Jewish audience. Through this parable, Jesus answers the question about who was our neighbor. A neighbor was not restricted to one's village or tribe, but expands beyond nation, race, or religion to all humanity. The requirement of showing magnanimity and compassion to others, especially to those in greatest need, stirs both heart and mind. The first question which the priest and the Levite asked was: "If I stop to help this man, what will happen to me?" But… the good Samaritan reversed the question: "If I do not stop to help this man, what will happen to him?" In this 21st Century, the message of the parable very well might be received with a certain degree of frustration and skepticism. One can imagine a variant of the parable in which the Good Samaritan returns to the inn and finds the man recovering, but seated next to him is his lawyer. The victim of the robbers had learned of the Samaritan's actions and figured that he was a man of means. He calls his lawyer who "smells money" too. He accuses the Samaritan of aggravating the man's injuries by conveying him to the inn and causing emotional trauma to the man by leaving him with strangers and abandoning him. Outside of the inn, the priest and the Levite reprimand the Samaritan for "getting involved." This parable, however, is too important and too crucial to the men and women of this age to allow the message to be ridiculed. For nearly half a century, the morals of our society have declined increasingly and the condition of human relations has become strained and alienating. The obsessive emphasis on personal achievement and satisfaction at all cost has given birth to an attitude toward others that primarily is pragmatic and dehumanizing. When self-interest is the only motivating factor in relationships, then loving marriages, faithful friendships, and certainly world peace becomes an impossible goal to reach. When compassion and sacrifice are out of fashion, the lyric of Judy Collins' song, Hard Time for Lovers is having its day: "Everyone singing, I've gotta [sic] be me without you." Sparking some hope, the following lyrics are meditative over what harvest has been reaped from the seeds of narcissism and what the result of all of this so-called freedom has been. For the modern person to grasp the intent of the parable of the Good Samaritan, a volte-face regarding the value and purpose of life will be required. Thankfully, there are many shafts of heavenly light shining through the gloom. Reports of people becoming thoughtful about the environment are coming in. The "environment" mentioned is not that of air, land, and water, but of the heart, mind, and soul. If the same care that is given to the quality of the products one buys can be administered to the person one is, a door can open for God's grace to enter and perform its miracles. One may hope that the mismanagement of human relations can be rectified. Love is stronger than indifference and somehow it will prevail. Perhaps, I may be allowed to extend a Saint Valentine's Day wish to all you? If so, then I pray that faith and love will make of you a Good Samaritan and, if needed, the recipient of one.